Well, I've caught it..... Ukulele Fever. I have heard it runs rampant here in Hawaii, but I never expected I would catch it. It all started about 15 years ago when my mom bought me a little "touristy" ukulele to decorate my home with! My house is all Hawaiian-Tiki theme, and she thought a little ukulele would fit right in. I have never played a musical instrument in my life, and was never planning on playing the ukulele either. It looked adorable sitting on the stereo cabinet -- strictly home decor!! Then, when I got back into painting and had to have my Hawaiian music playing in the background, most of which includes the Ukulele, I thought it would sure be fun to be able to play. 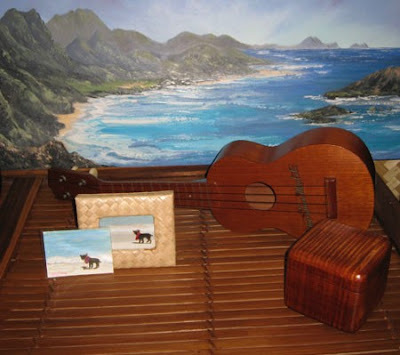 So, I brought it home and picked up my little tourist ukulele and tuned it to "my-dog-has-fleas" as best as I could. I tried to follow Teresa's DVD and was becoming frustrated. I did not know how to read music, didn't know the first thing about chords and counting and all that stuff, but I do know what SOUNDS right (and my playing did not!!). But, I kept at it and tried over and over again. It was almost like trying to learn a foreign language. And then, all of a sudden, it started to click. My brain was beginning to memorize the different chords and my fingers were starting to hop automatically to where they needed to go. It almost started to sound like music..... almost. Like I said, this ukulele was strictly bought for decorative purposes and was far from containing any real musical quality, but I played it all weekend long and was getting better and better at it. This is when I caught THE FEVER!!! Mother's Day was coming up and Brighton wanted to buy me a decent ukulele. I was all for it! There were two different ones that I really liked and I couldn't decide between the two. We brought both home, planning on trying them and seeing which felt better to me, and I would return the other one. Well, I tried them both, and I did like one over the other. But then something funny happened. Dean picked up the other ukulele that we had planned to return, and HE CAUGHT THE FEVER!!! He also had never played ukulele before, although when he was young he had played a few musical instruments and knew a few chords. We decided to keep both ukuleles and spent the day watching the Teresa Bright DVD over and over again. Her teaching style is amazing and it was so easy to learn the different chords. By evening, we both could play the three Hawaiian Songs on her DVD. We were amazed with ourselves!!! If I knew it would be this fun, I would have tried it years ago! 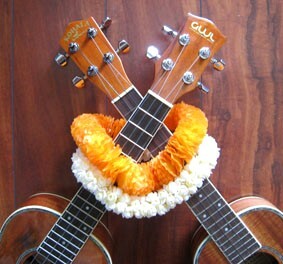 Here are our new (and improved) Ukuleles. They are made of curly koa and I think they are just as beautiful to look at as they are fun to play! 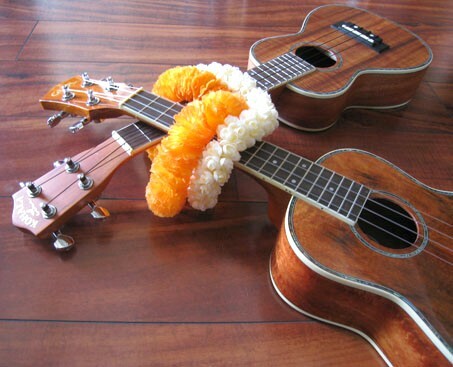 I love music, and to be able to play something on the ukulele that is even semi-recognizable is so thrilling!! 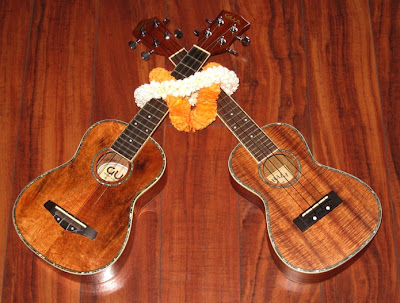 We keep the ukuleles setting on the stereo cabinet, just as our little home decor uke before them. But now, whenever we walk past, we have the urge to pick them up and start strumming. It is so fun to be able to do something together that we both enjoy. We recently signed up for lessons so that we learn CORRECTLY how to play. Unfortunately, the ukulele takes up a lot of my time now, I need to make more time for painting. But it really is rather addicting! The other day, I was in the middle of painting, listening to my Hawaiian music, and this song came on that I thought "This would be fun to try to play on the uke". I dropped my palette knife and grabbed my ukulele. Slowly but surely, just by ear, I figured out the basic chords needed to play the song. And about 2 hours later, I had figured out the entire song and was playing it over and over again, totally forgetting the fact that I had been in the middle of a painting! That's what Uke Fever does to you! It gets in you and you can't get rid of it. And I don't want to get rid of it. I have found something new that I love to do, and it has opened up a whole new musical world for me! 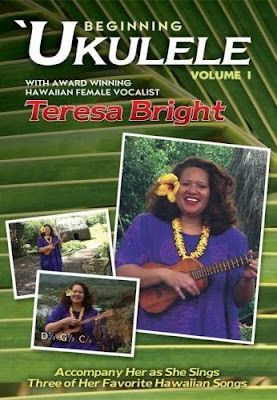 Teresa Bright is a famous Hawaiian singer and ukulele player here on the Island of Oahu. If you want to check out the DVD I used to learn how to play, click on the picture below. I highly recommend it if you want to learn to play Hawaiian Music on your Ukulele! 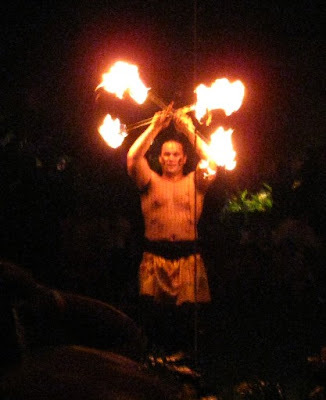 DANCING WITH FIRE AND KNIVES ! 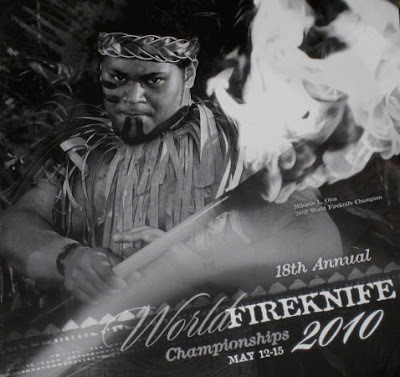 The other night, we went to the 18th Annual World Fire Knife Championships in Laie, up near Oahu’s North Shore, at the Polynesian Cultural Center. What a treat it was!!! 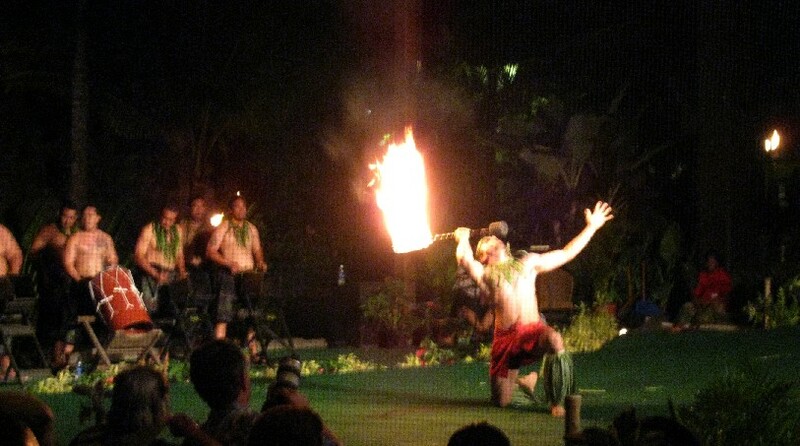 We got to see the world’s BEST fire knife dancers show off their amazing skills. 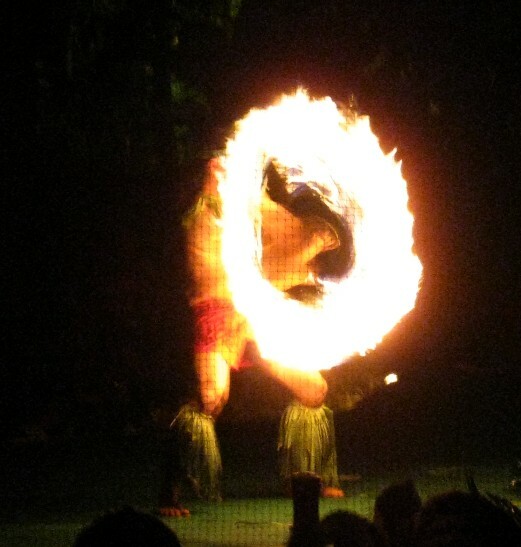 The fire knife was originally used as a weapon in the islands of Samoa. 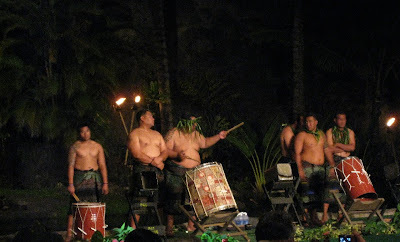 It is now considered a marshal art, and is demonstrated in many shows and island gatherings across the Pacific. If you ever have the chance to attend this competition, you must! It is unbelievable and totally amazing -- and so exciting!! 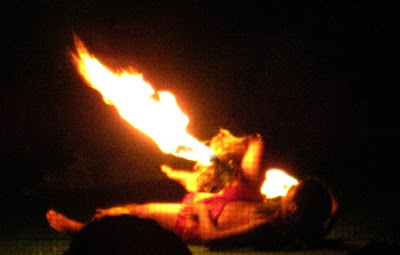 This is what a fire knife looks like. 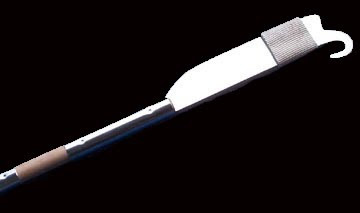 As the name states, there is a blade and a sharp hook at one end. There are two wicks, one at each end, for a double flame on each knife. 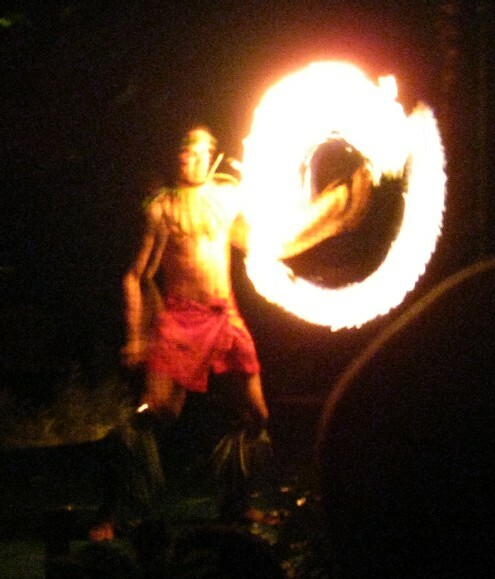 The competitors use two knives (4 flames) at the same time and can actually attach the two knives together using the hooks. They make it look so easy, and you have to keep reminding yourself that this is FIRE – real fire – that can burn you in an instant. Not to mention the sharp blades and hooks that could take a mean chunk out of you if you happen to twirl them just a little bit off, or fail to catch them correctly, as you fling them 20 feet in the air above you!! Here are a few pics of the competition. It is very difficult to get decent fire knife photos, as they are twirling the knives so fast, and it is so dark, but here are a few of my better ones. Some of the competitors getting ready to show off their amazing skills. There were 24 competitors this night alone (with more the next night), but unfortunately, we could not stay for the entire show. It went well past midnight, and we had a long (well, long for Hawaii standards) hour and a half drive back home and work the next day. So, sadly, we left the show early, with the drums still beating in our brains, we made the long, dark drive back home. It was a wonderful evening, and something I will never forget!! 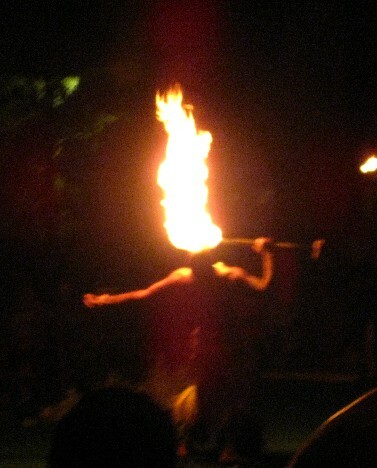 Below is some video of the fire knife competition. ANOTHER BRIGHT IDEA FINALLY MAKES IT TO HAWAII !!! “Another Bright Idea” in person!! Yes, she FINALLY did make it out here! 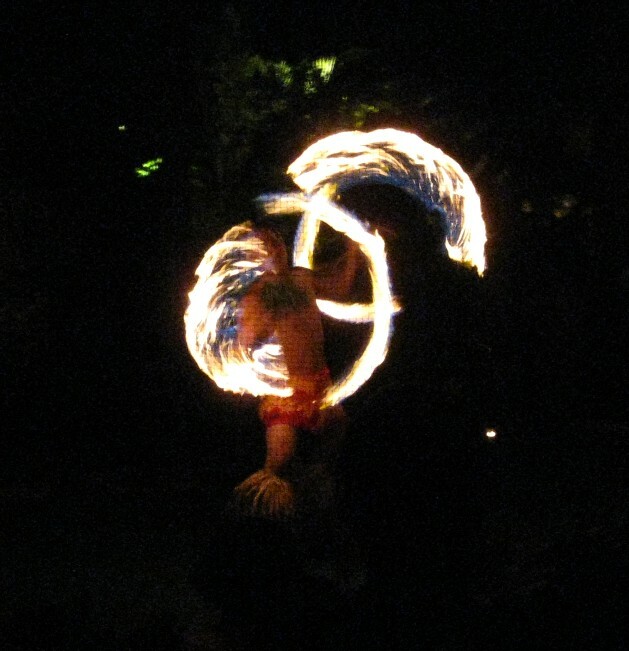 If you don’t remember, Felicia featured “Hawaii Week” on her blog back in February, where she interviewed four artists living in the “Land Of Aloha”. That was what she needed to inspire her to finally book a trip. 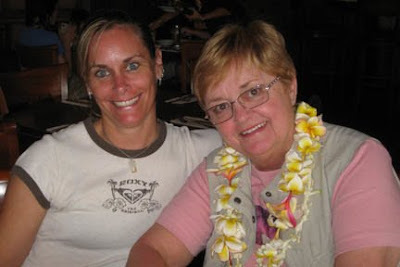 Although she was only on Oahu for a very short time, Brighton and I were able to meet up with her, and her wonderful sister, Fran, and spend an afternoon with them. We drove around the island a bit, stopping at a few of the beautiful lookout sights. Here are Fran and Felicia at Diamond Head Beach. Unfortunately, it was a bit gray and hazy, not the usual strikingly gorgeous scenery I am used to, but it was still beautiful. 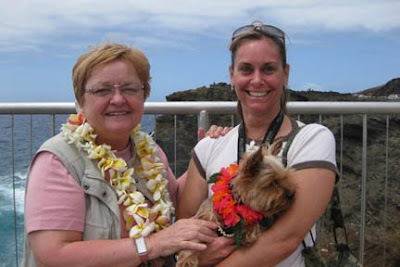 Here we are at the Halona Blowhole Lookout. Brighton is very camera-shy and as soon as he sees a camera pointed at him, he will look away. We then headed on to Kailua town. 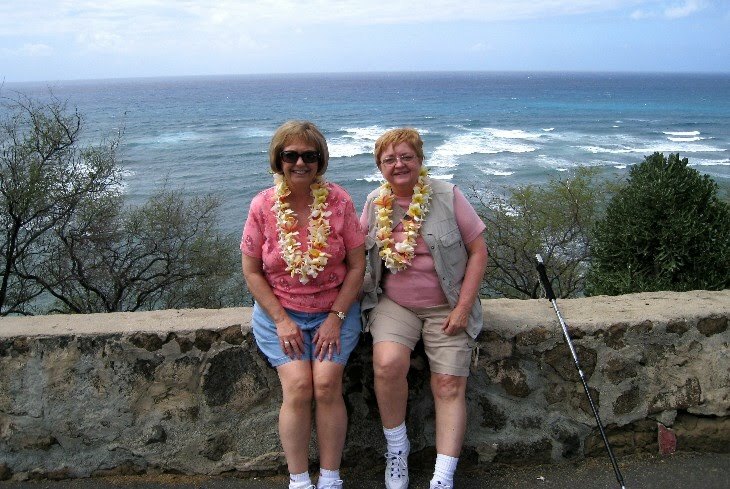 I have to say, Felicia and Fran are two of the most easy-going people I have ever met. I instantly felt like I had known them for years, and there was never an uncomfortable feeling or loss of interesting topics to chat about. And believe me, Felicia and her sister have some great stories! One of the funniest was the tale of how they went to see “The worst movie ever”, “Sweeney Todd: The Demon Barber Of Fleet Street”. I had never even HEARD of it before, so they basically gave me the rundown of how Johnny Depp is this barber who pretends to give the customer a shave but actually slices their throat killing them and then the wife makes them into pies and sells them…… or SOMETHING like that. 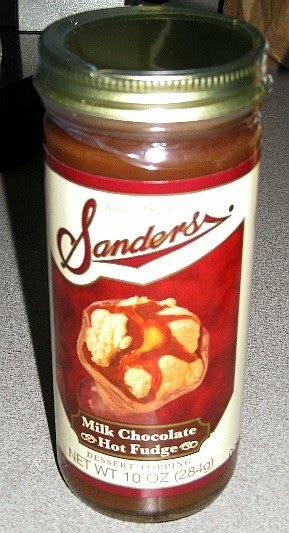 Felicia brought me a bottle of DELICIOUS “Sanders Milk Chocolate Hot Fudge” all the way from her home state. She said they are famous for it. I can see why. The stuff is unreal. It is so creamy and tastes like nothing you buy in the supermarket. I am hooked! MAHALO !!! We stopped in Island Treasures for a quick peek at their new gallery. Felicia and I both couldn’t resist some adorable Plumeria earrings, and we each bought a pair. It was fun listening to her sister tell me about her piano lessons. She is such a pleasant person, and I am so glad Felicia brought her along. Unfortunately, it was getting late and I didn’t want to take up their entire day, as they were going to be flying on to Kauai tomorrow. So, we drove back over the Pali. It was kinda rainy and overcast, so we didn’t stop at the Pali lookout. We were having a hard time keeping Fran from zoning out in the back seat. They had had a long eventful day the previous day, and I didn’t want to wear them out completely! Bry and I dropped them back off at their hotel and gave them a huge Hawaiian hug. It was so great to finally get to meet another Etsy Artist in person, and have such a great day on top of that! They are flying on to Kauai where they will be lucky enough to get to meet Marionette and Dava, as well. I am still trying to find a way to get to Kauai and visit “Painting Paradise” myself. Have fun, you guys! And have a safe trip back home.